The most economical tracking method for steel belts is to attach rubber v-ropes to the underside of the belt. These ride in v-grooved sheaves, or outside of the terminal drums. Best way to find out what you need is to measure the width of the v-rope itself. 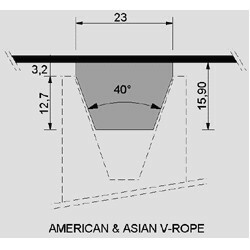 So if you got a v-rope that is 23 mm wide (0,91 Inches), you would order an „US-Profile/ American V-Rope“. 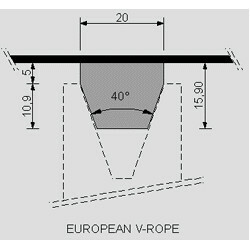 If your width is smaller like 20 mm (0,79 Inches), you would ask for an “European V-Rope”. So this is the first step in making an order for a new belt. There is however still the question of: where is the v-rope located on the belt? To know more about this topic just click here (hyperlink) and read the further instructions. This is just a brief overview over common v-ropes-dimensions. For in-depth information please contact Contibelt via mail: band@nullcontibelt.com.